Calling all Ladies and Gents… you’ve done for your kids all day long. Now do something FUN for yourself! Exercise, meet new friends, and laugh! These are only some of the reasons you should enroll in our Adult Dance Program. We offer classes in Ballet, Tap, and Hip Hop with performance opportunities, too. So dust off your dancing shoes and come join us! 7 to 9 years old. Young Children's dance required or new pre-teen age level. Must be in at least 2nd grade. This is a 1 1/2 hr. class including ballet, jazz, and tap in a combination. A more disciplined class to gently start preparing them for separate class or performing group. Continuation of skills in ballet and tap are taught as well as basic beginning skills in jazz. Routines in ballet, tap and jazz are performed in the spring recital. Students continue to take a more mature and disciplined attitude toward their dance. This is a faster moving class with emphasis on progressing to the next level, which is separate classes and performing group. Intended for our male students only, this class covers the technique of jazz dancing, the style of hip hop, and the rhythm of tap. It is a positive environment for boys to explore and pursue a basic interest in dance. 9 to 11 years old. Previous combination class training. This is designed for the more serious student 9-11 yrs. that will want to go on pointe (toe dancing) eventually. These are separate classes offered in ballet, tap, and jazz. This requires two nights per week with a 1 hr. ballet class on one day and jazz/ tap in a 1 1/2 hr. combined class. Students may choose to only do one subject at this level or continue in all three. Students must have at least combination experience. This is usually started at the age of 9-10 years of age. Children will have the opportunity to be in the Fall Ballet each year and can try out for special parts in the spring recital. This should be considered a year-round program. Children should try to keep their technique strong by doing at least six weeks or a ballet workshop during the summer months. Ballet is the “backbone” of all dance training. In ballet the student will learn grace, elegance, technique, discipline, flexibility, stamina, and endurance. We strongly feel that ballet is the most important dance form that a child or adult can study. We offer Ballet for all ages and abilities. We produce a Fall Ballet such as “The Nutcracker” and various other classical ballets each year for the performing group classes. All students that wish to participate are eligible as long as they meet the minimum class requirements over the summer. Focus for the more serious Ballet students. Classical variations are taught along with preparations for auditions including the Denver Ballet Guild. Continuing advanced education for the serious Ballet student. Pas de deux work is introduced and perfected. Enjoy learning the Foxtrot, Waltz, Swing, County, Latin (Samba, Tango, Rumba). No Contracts. Must have own partner. Couples or groups. Specializes in wedding preparation. 6 to 7 1/2 years old. At least 1 year Kindergarten dance or beginner. Must be in 1st or 2nd grade. This is a one-hour class for 6 to 7 years of age including ballet, tap and tumbling in a combination. Basic skills in ballet and tap are covered. Simple routines in both ballet and tap are taught for the spring recital. If your child took Kindergarten Dance last season or they are new to dance and 5 to 7 yrs. of age, they should sign up for BCD this fall. Advanced level/strong pointe work required. Teacher recommendation required. Usually by this level children have reached an advanced level. Children need to be taking 2-3 ballet classes per week in ballet. One class in technique, pointe, repertory and they may also take the partnering class offered. Jazz and tap are also offered at this level. These students are offered main lead roles in both the Fall Ballet and the Spring Recital. Students need to be year-round and continue their studies in the summer. Hip Hop is designed to help the dancer loosen up, gain rhythm, and have fun in an aerobic workout. Moves from MTV and other videos on TV with popular artists will be taught. This is a great way to get a good workout, have fun and gain confidence. This is an extra class that should be taken along with regular technique classes. It is not designed for the serious trained students as a main class. 6 to 8 years old. At least 1 1/2 to 3 years of dance. Must be in at least in 1st grade. This is a one-hour class for 6-8 years of age including ballet, tap, tumbling and jazz in a combination. A continuation of skills in both ballet and tap are taught. Tumbling and basic introduction to jazz are alternated. Routines in ballet and tap become more complex for the spring recital as their skills progress. Jazz is not performed in this level. The students continue to master and fine-tune their basics. Children should have had 1 1/2 to 3 years of dance before they enroll in this class. They should also be in at least 1st grade. 11 to 14 years old. Completed separate classes in Apprentice, Novice and Premier levels. Have completed pre-pointe class for 1 to 2 yrs. Ready for pointe work. Teacher recommended only. These classes are designed for beginning pointe work for students 11-14 yrs. with teacher approval. They need to take at least two ballet classes per week with one being a technique and one a pointe class. There is also a new pointe class offered for the basics of starting pointe offered on Friday at the Hampden studio. This is open to all new or beginner pointe students that wish to gain strength at a faster rate. Requirements for summer are 12 ballet classes or 2 workshops to be eligible for the Fall Ballet. These students are eligible for to try out for special parts in the spring show. Students in this level should be year-round in Ballet. Jazz and Tap are offered back to back. Jazz and Tap are strongly suggested to achieve a more advanced level if they continue to study all styles of dance. Usually by this level children have been in pointe work for 1-2 yrs.. Children need to be in an intermediate level working 2-3 classes per week in ballet. One class should be a pointe class and the others technique and/or repertory. Jazz and tap are offered back to back. Children will be offered demi-soloist roles in the Fall Ballet and more featured parts in the spring recital. Students should dance at least 15 ballet classes in the summer or 2 ballet workshops to maintain growth and be eligible for the Fall Ballet. Students this level are eligible for special parts in the spring show. This is designed for year-round participation. Students should also continue in their jazz and tap program if they continue in all subjects. Jazz is sharp and fluid movements to create a visually technical dance and style. It is usually done to popular music. Body isolations, stretch, turning, leaping and technical steps are taught in this class. 4 1/2 to 5 1/2 years old. At least 1 year of Preschool or Kindergarten Dance, or a Beginner that is at least 5 years old. This is a one-hour class for 4 1/2 to 5 1/2 years of age combining ballet, tap and tumbling in a combination. Basic listening skills and following directions are emphasized while learning the basic fundamentals of ballet and tap. Simple routines in both ballet and tap are taught for the spring recital. If your child took Preschool Dance last season, they should sign up for Kind. Dance this fall unless they are still 3 yrs. of age then they should stay in Preschool Dance. Lyrical/contemporary is a fluid form of dance done to popular ballads and slower contemporary music. The dancer is taught to interpret his or her movement with feeling, motion and style. They will learn to tell a story or create the picture of the song. This style combines the fluid beauty of ballet with the more sharp moves in jazz. A Ballet or Jazz class is recommended along with lyrical/contemporary to build in technique. Ages 18mo - 3 year olds. An introduction to dance for our very youngest dancers. Ages 18mos. - 3 year olds are invited to attend a 6 weeks session of “Mommy & Me”. These classes are structured to stimulate coordination skills, listening skills, balance, music interpretation, creative movement and motor development in the youngest dancers. This program is an excellent introduction to the world of dance. A parent or guardian participation is required. No registration fee required for these classes only. A fun class for all ages! Students learn basic theatrical, vocal and dance skills through skits, songs, scripts and games. 9-12 years old. Separate Classes. Completed Apprentice level. This is a continuation of separate classes for 9-12 yrs. Children should be taking two ballet classes to build strength and continue in their technique training. This requires two nights per week with a jazz and tap class offered with each ballet class back to back. Fall Ballet performances and special parts for the spring recital are available for this level. Students should dance at least 12 ballet classes in the summer or 2 ballet workshops to maintain growth and be eligible for the Fall Ballet. It is strongly recommended to continue training year-round. Miller's Dance Force audition only. 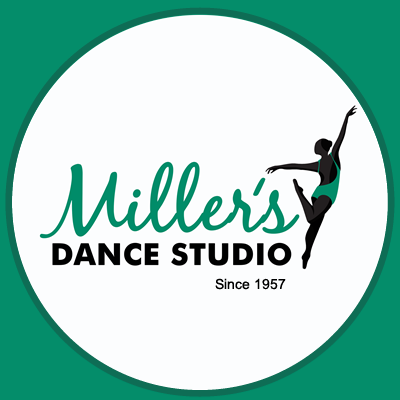 5-7 yr. Miller's Dance Force company classes. Pilates is an exercise and physical rehabilitation technique created as a series of controlled movements requiring focus and concentration to develop flexibility, balance and strength without bulk. The Pilates method emphasizes “centering,” or the abdominal and torso area, balance and breathing to create good posture and protect against injury. Pre-pointe for 1-3 years. Teacher recommendation only. Dancers must have reached Intermediate/Advance level and have been taking 2-3 ballet/repertory classes a week for at least one year and be at least 11 years of age. For the safety of the dancer, teacher recommendation is required for pointe shoes and they are looking for dancers with strong cores and ankle strength and dancers who are able to hold their ballet placement at barre and center. A high-intensity jazz/poms class with a focus on choreography, technique, and performance styles. Choreography integrates the use of poms and props. This is a great class for cheerleaders and future pom hopefuls. Get prepared for auditions NOW! For ages 10-13 yrs. Apprentice and Novice classes completed. Ready for pre-pointe work as per teacher recommendation. These classes are designed to prepare the student 10-12 yrs. for pointe work. They need to take at least two ballet classes per week with one being a technique and one a pre-pointe class. Jazz and Tap are offered back to back. Requirements for summer are 12 ballet classes or 2 workshops to be eligible for the Fall Ballet. Students should be year-round when studying pre-pointe. Students in this level are eligible to try out for special parts in the spring recital. Jazz and Tap are strongly suggested to achieve a more advanced level if they continue to study all styles of dance. 60-minute pre-ballet/jazz program. We develop an enjoyment of music and movement as well as a positive self-image as primary goals. Basic ballet/jazz terms and steps are taught along with tumbling skills. 45-minute pre-ballet program. We develop an enjoyment of music and movement as well as a positive self-image as primary goals. Basic ballet terms and steps are taught along with tumbling skills. This is a class designed specifically for the serious dancer who wishes to perfect and refine their skills of turning, jumping, and leaping. These classes are taught with an emphasis on technique and correct body placement. They are taught in a progressive manner beginning with the basics and advancing to high level skills and combinations of those skills.This class is also very important for the students wanting to do poms or are a current pom to gain technique required for tricks in routines. The strength and conditioning is designed to build stamina and condition the body for difficult tricks and aerobic requirements needed for advanced dancing. Tap is one of the oldest dance forms in this country. Students are taught rhythms, timing, and leg/foot coordination done to various types of music. We teach all types of tap from standard basics like “Singing in the Rain” to funky rhythm tap as seen in “Bring In Da Noise.” Students will receive well-rounded knowledge of all types of tap. Ages 10 and up, at least 4th grade. This is for the new older student age 10 and up, at least 4th grade that has had little or no previous training in dance. Basics in all areas are taught and performed in the spring recital. This gives the student a chance to be introduced to the different forms of dance so that they can either continue in all subjects or choose which style they wish to continue to study for the next year.This may combine ballet, tap, and jazz in combination. This 45 min. class is designed for the 5-9 yr old that want to explore funky movement, jazz and hip-hop. There will also be emphasis on gross motor and free style movement. This class should be in addition to their regular ballet and tap combination classes. This is a fun and exciting class addition to their regular core classes. Tumbling is a combination of acrobatics and gymnastics. It consists of floor tricks (cartwheels, round offs, backbends...etc) It focuses on building muscle, strength and flexibility.